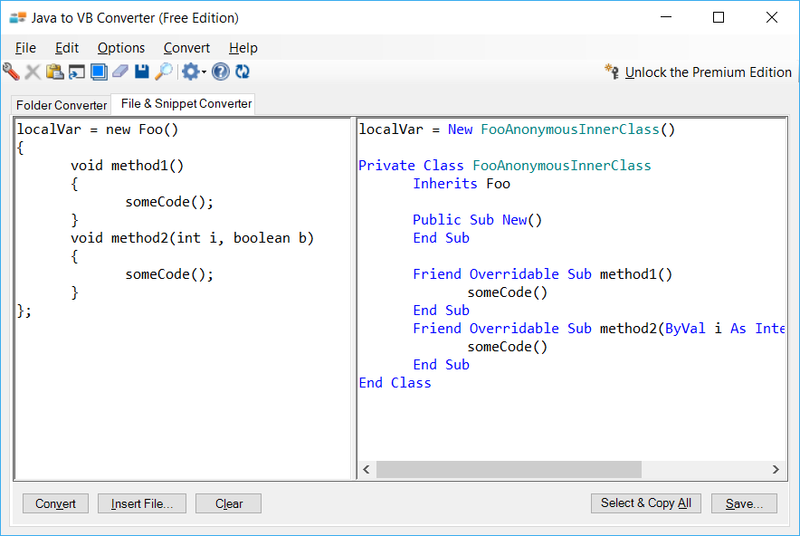 Java to VB Converter produces great VB.NET code, saving you hours of painstaking work and valuable time. 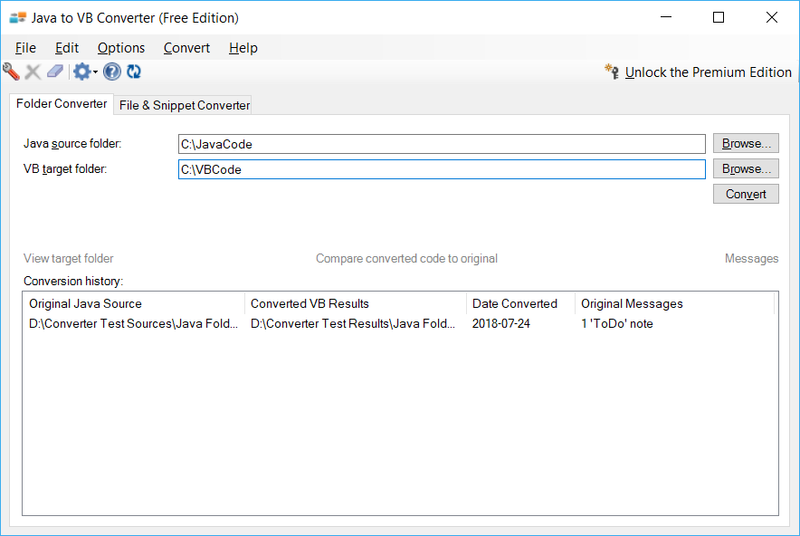 *Scroll right to see Java to VB Converter in action! Q: Are the original Java files altered in any way? Your existing code is left completely intact. The new VB.NET files are written to the new location that you specify. Our accuracy is the highest in the industry, but there will be significant adjustments required for all but the simplest conversions. There are no direct equivalents in VB.NET for some aspects of Java. Read the rest of the FAQ to get an idea of a few things that are not converted. 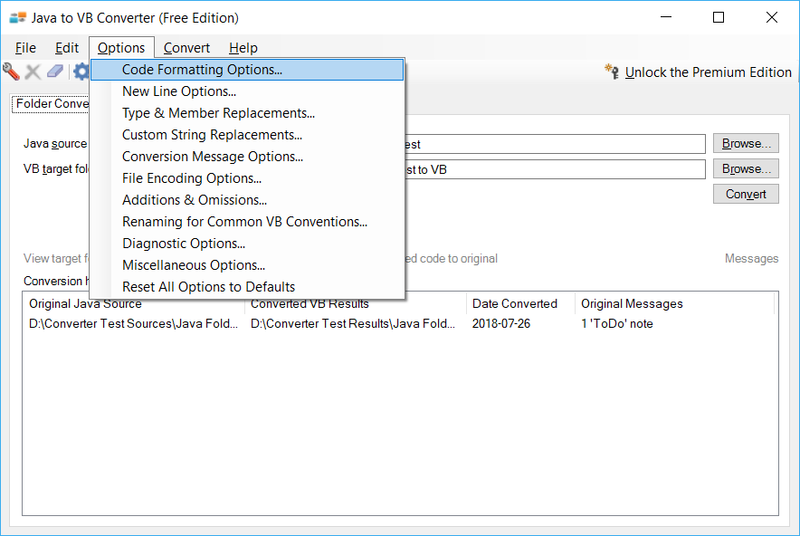 Java to VB Converter is intended to reduce the amount of work you'll have to do to convert code to VB.NET, but it is just the first step. 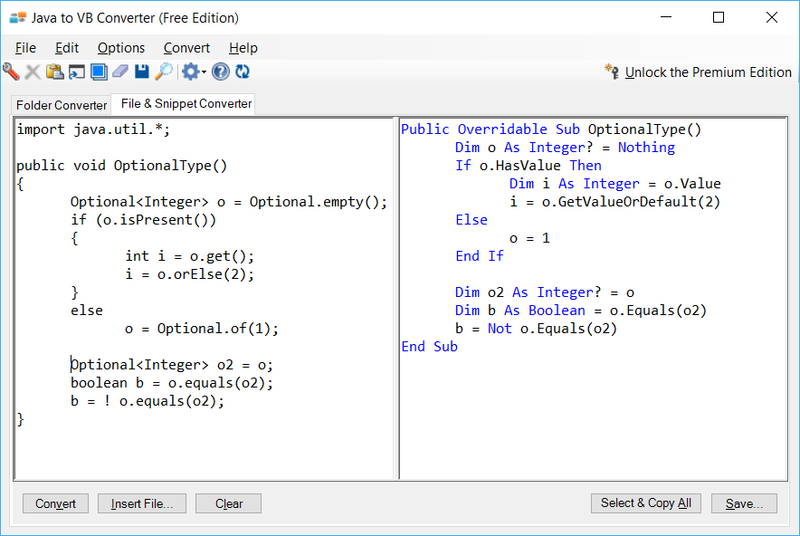 Q: Can the converter produce VB6 code? No. Only VB.NET code is produced. Q: How are anonymous inner classes handled? 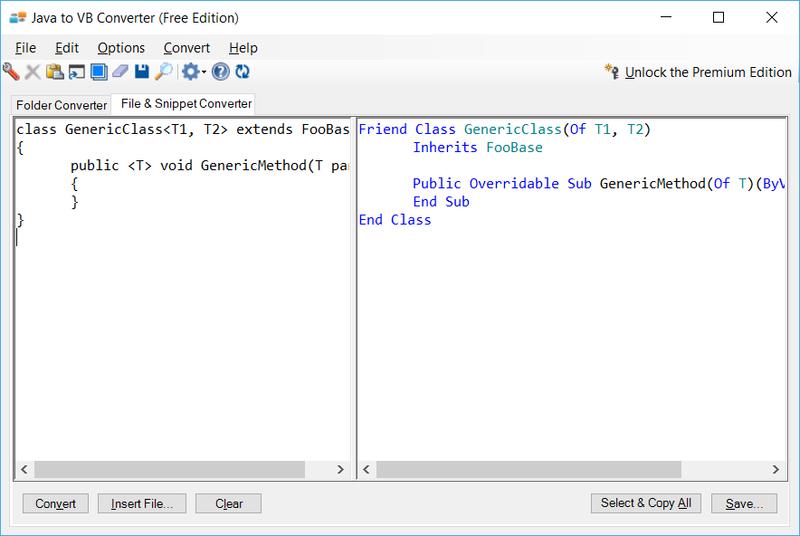 Anonymous inner classes are converted to VB nested private classes, but if the interface is a functional interface, then the interface is converted to a delegate and the anonymous inner class is converted to a lambda. Q: Are Java functional interfaces converted? Yes - try out our Free Edition to see the conversion details. 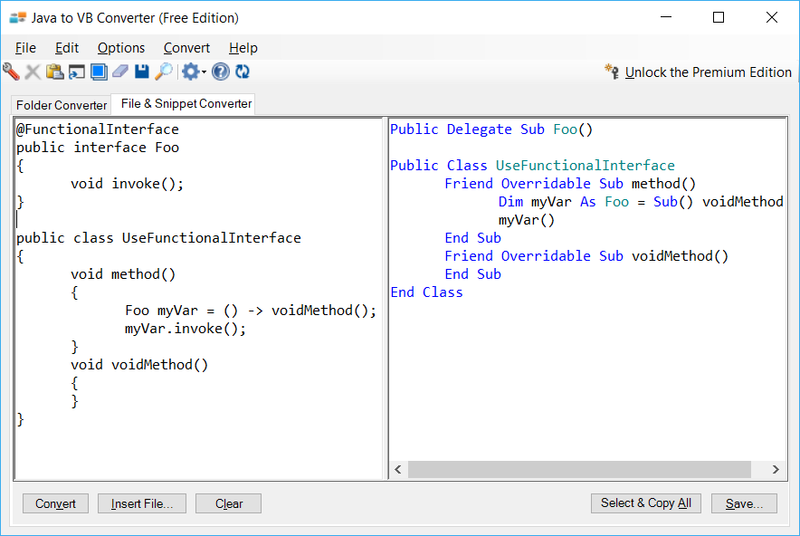 We optionally convert Java functional interfaces to VB delegates. Most Java platform or library function calls are not converted. However, we do convert a subset of the Java string, keyboard I/O, math, and utility function calls. Also, many Java container classes are converted to .NET container classes. VB does not allow assignments within expressions, but Java does (e.g., while ((x = y()) > 0) assigns a value to x as part of an expression). 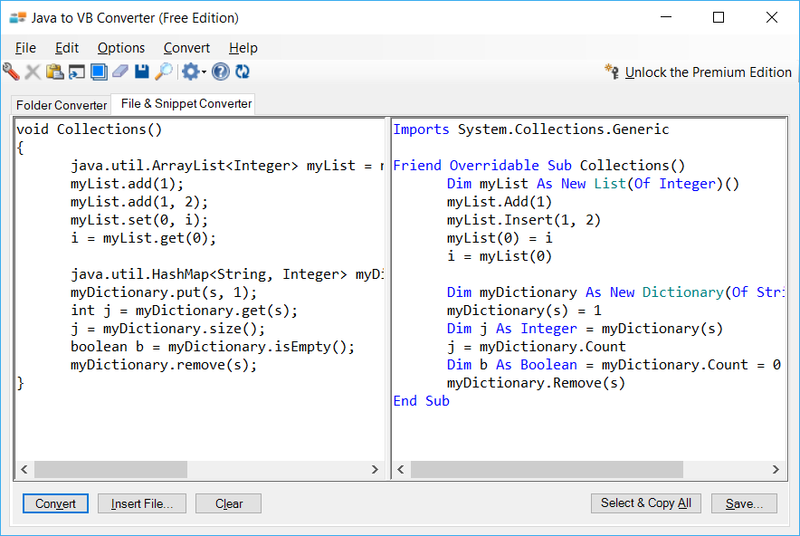 The converter will convert some cases, but will mark other more complex cases with a "ToDo" comment. You must manually adjust these. Some reference type comparisons are converted, but you will need to manually change some equality symbols to "Is". The VB compiler makes these adjustment requirements obvious. Java's event handling model has no direct equivalent in VB. Java wildcard generics have no equivalent in VB, unless used in a method declaration parameter list. Java local classes cannot be declared within methods in VB. These are marked with a comment.